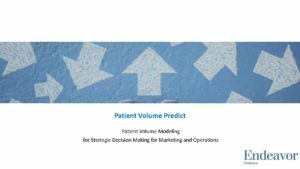 In this presentation, our approach to patient volume modeling is reviewed. This model is used for marketing and operations strategic decision making. As hospitals and healthcare systems are trying to increase commercial revenue (non-government funded) to sustainable profitability, many are unable to address this problem strategically due to data dispersion and the analytical model required to establish cause and effect relationships. Endeavor Analytics’ digital tool assembles, models and predicts the impact of market changes, marketing and operational activities on all-payer patient volumes. Using this modeling approach, healthcare organizations better understand their individual and comparative performance to prescribe key marketing actions; and identify the operations levers that will most affect volumes.